Explore different techniques and styles that make great abstract works of art, as well as how the traditional Elements of Art and color theory affect the creation of such works. Teens will practice applying the techniques in their own artwork to achieve their desired aesthetic in abstraction. 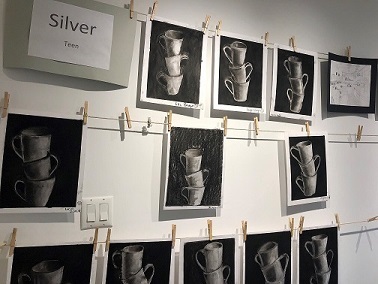 Expressive Ceramics: Teens will learn the fundamentals of hand-building, wheel throwing, and applying glazes as they create expressive works of art in clay. Fine Art Mixed Media Collage: Explore the possibilities of collage! Utilizing a variety of materials, teens will investigate different approaches and techniques to the art of collage. Materials may include textiles, magazines, scrapbook paper, and construction paper, as well as personal photographs, or hand-painted paper. The possibilities are endless!